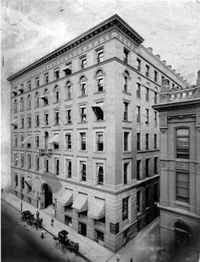 The remodeling of the Glass Block Building was a project similar to the St. Louis Hotel. Three floors were added to an existing building, and the existing two floors were opened up to provide for display windows. "Glass blocks" were the outgrowth of advances in structural systems, mechanical systems, glazing technology, and lighting. 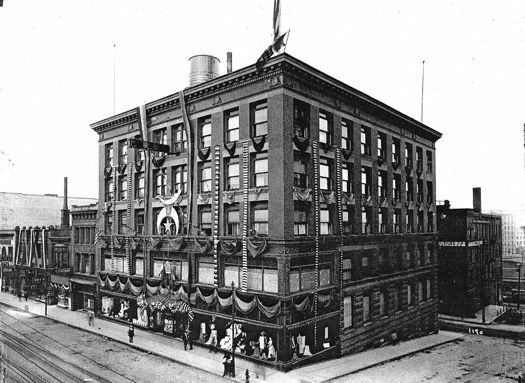 The Bowlby Building (1895) is a rather exuberant example of the trend for glass blocks that became popular across America. This less exuberant example features exposed cast iron construction on the first two floors that is embellished with Renaissance details appropriate to the rest of the building. Although the building design reveals nothing revolutionary, interesting details include the placement of transoms over double-hung windows and massive lintels that reduce the spandrel brick to merely three courses. The property owner was the Boston Northwest Real Estate Company, and the tenant was the retailer, Panton & White.